Martyrdom of Andries Langedul, Mattheus Pottebacker, and Laurens van der Leyen, Antwerp, 1559. 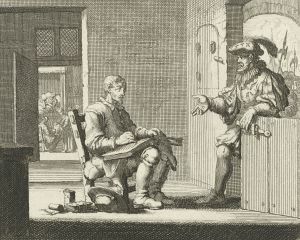 Engraving by Jan Luiken in Martyrs Mirror, v. 2, p. 263 of Dutch edition. Mattheus Pottebacker (Mattheus de Smidt or Smet), an Anabaptist martyr, beheaded with two other martyrs on 9 (or 4) November 1559 in the Steen castle at Antwerp, Belgium. Mattheus had been (re)-baptized by Gillis van Aken. His name is found in the hymn "Aenhoort Godt, hemelsche Vader" (Hear, O God, heavenly Father), found in the Dutch hymnals Nieu Liedenboeck of 1562 and Lietboecxken van den Offer des Heeren (No. 16) of 1563. Antwerpsch archievenblad IX: 5, 10; XIV: 26 f., No. 302. Braght, Thieleman J. van. Het Bloedigh Tooneel of Martelaers Spiegel der Doopsgesinde of Weereloose Christenen, Die om 't getuygenis van Jesus haren Salighmaker geleden hebben ende gedood zijn van Christi tijd of tot desen tijd toe. Den Tweeden Druk. Amsterdam: Hieronymus Sweerts, 1685: Part II, 262. Braght, Thieleman J. van. The Bloody Theatre or Martyrs' Mirror of the Defenseless Christians Who Baptized Only upon Confession of Faith and Who Suffered and Died for the Testimony of Jesus Their Saviour . . . to the Year A.D. 1660. Scottdale, PA: Herald Press, 1951: 633. Available online at: http://www.homecomers.org/mirror/index.htm. Hege, Christian and Christian Neff. Mennonitisches Lexikon, 4 vols. Frankfurt & Weierhof: Hege; Karlsruhe: Schneider, 1913-1967: v. III, 385. Wolkan, Rudolf. Die Lieder der Wiedertäufer. Berlin, 1903. Reprinted Nieuwkoop : B. De Graaf, 1965: 63, 72. Zijpp, Nanne van der. "Mattheus Pottebacker (d. 1559)." Global Anabaptist Mennonite Encyclopedia Online. 1957. Web. 25 Apr 2019. http://gameo.org/index.php?title=Mattheus_Pottebacker_(d._1559)&oldid=162718. Zijpp, Nanne van der. (1957). Mattheus Pottebacker (d. 1559). Global Anabaptist Mennonite Encyclopedia Online. Retrieved 25 April 2019, from http://gameo.org/index.php?title=Mattheus_Pottebacker_(d._1559)&oldid=162718. Adapted by permission of Herald Press, Harrisonburg, Virginia, from Mennonite Encyclopedia, Vol. 3, p. 539. All rights reserved. This page was last modified on 17 December 2018, at 11:47.